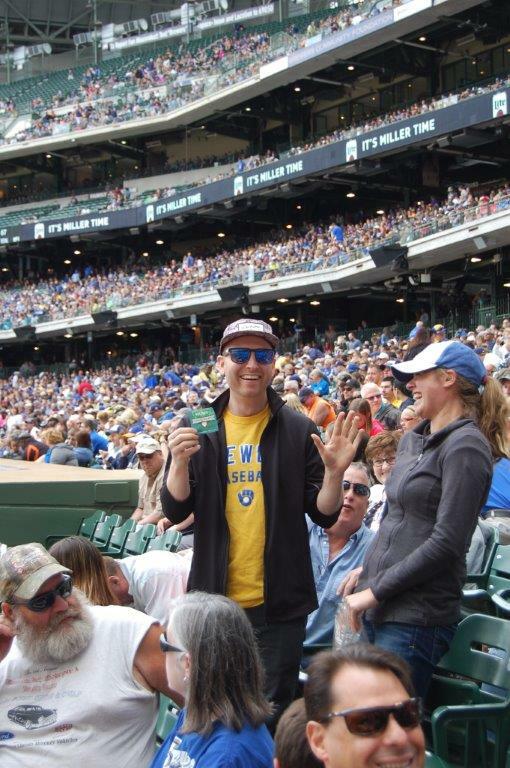 New Associated Bank program designed to engage fans and support Housing Resources, Inc.
MILWAUKEE – June 13, 2016 – During Sunday’s Brewers game, Associated Bank kicked off the Hunt for Home Plate program that created a frenzy of action as fans looked for 25 specially marked home plate stickers hidden below their seats. The winners claimed a limited edition home plate replica and registered for an exclusive Hunt for Home Plate Ultimate Fan Experience on September 8, 2016 at Miller Park. The Hunt for Home Plate program continues through July 10, 2016. For more information, visit Associatedbank.com/homeplate. A total of 25 home plates will be hidden throughout Southeast Wisconsin at participating Associated Bank branches. Daily clues on Associated Bank’s social and digital channels will direct fans to local branches to claim their limited-edition home plate replica and register for the Hunt for Home Plate event inside the stadium. The September 8th Hunt for Home Plate event will feature food and beverages, batting practice on the field, the opportunity to slide down Bernie the Brewer’s slide as well as take photos with Bernie and the Famous Racing Sausages, and more! Associated Bank will will donate $100 to Housing Resources, Inc. for each home plate that is found. This donation will help provide support to low- to moderate-income homeowners and home buyers in the Milwaukee community.